Alexander Hamilton is one of the few American figures featured on U.S. Currency who was never president. He was killed in 1804 in a duel with Aaron Burr. Alexander Hamilton conceived of the First Bank of the United States as a way to standardize American currency and cope with national Revolutionary War debt. The Bank still stands today on Independence National Park in Philadelphia. The first issue that Hamilton tackled as Washington's secretary of the treasury concerned the problem of public credit. Governments at all levels had taken on so much debt during the Revolution. The commitment to pay them back was not taken very seriously. By the late 1780s, the value of such public securities had plunged to a small fraction of their face value. In other words, state IOU's — the money borrowed to finance the Revolution — were viewed as nearly worthless. Hamilton issued a bold proposal. The federal government should pay off all Confederation (state) debts at full value. Such action would dramatically enhance the legitimacy of the new central government. To raise money to pay off the debts, Hamilton would issue new securities bonds). Investors who had purchased these public securities could make enormous profits when the time came for the United States to pay off these new debts. The spinning jenny was one of several major technological innovations that made British textiles such an economic force. The central bank faced significant opposition. Many feared it would fall under the influence of wealthy, urban northeasterners and speculators from overseas. In the end, with the support of George Washington, the bank was chartered with its first headquarters in Philadelphia. 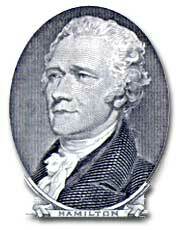 Rather than accept this condition, Hamilton wanted the United States to adopt a mercantilist economic policy. This would protect American manufacturers through direct government subsidies (handouts to business) and tariffs (taxes on imported goods). This protectionist policy would help fledgling American producers to compete with inexpensive European imports. Many Americans neither like Hamilton's elitist attitude nor his commitment to a British model of economic development. His pro-British foreign policy was potentially explosive in the wake of the Revolution. Hamilton favored an even stronger central government than the Constitution had created and often linked democratic impulses with potential anarchy. Finally, because the beneficiaries of his innovative economic policies were concentrated in the northeast, they threatened to stimulate divisive geographic differences in the new nation. Regardless, Hamilton's economic philosophies became touchstones of the modern American capitalist economy. Bet you $10 you now see why he's on the $10 bill. A solid biography of Alexander Hamilton, from the folks at the National Archives and Records Administration. Brief and nicely written, this page spends as much time on Hamilton's life as a young man as it does on his professional life. This comprehensive biography is one of the best Alexander Hamilton resources out there on the web. Spend some time and get acquainted with the life and contributions of this complex and enormously influential man. This page is part of a larger companion site to a PBS documentary based on the duel with Aaron Burr that ended Alexander Hamilton's life. It gives a good recap of Hamilton's biographical vitals, but its real strength is the detail with which it recounts the scandal that led to the duel. Anything you ever wanted to know about Alexander Hamilton, his ideologies, or his contributions to the U.S. governmental system, can be found here. This 42-page bio should be treated as a book: Scan the index for the period you're interested in, and click away. If you're looking specifically for info on Hamilton's financial plan, check out the excerpt from the bio below. It's possible that the founding of the U.S. was less a result of clear vision on the part of the Founding Fathers, and more an example of a grand compromise between various opposing ideologies. By recounting the conflict between Alexander Hamilton and Thomas Jefferson, this article focuses on 2 of the most central ideologies: Hamilton favored a strong and efficient central government; Jefferson was most concerned with maintaining individual liberties. Overall, a solid site, with images and links. 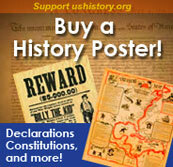 Alexander Hamilton drafted the call for a Constitutional Convention, and fought hard for the document's ratification. He was a staunch opponent of slavery and dedicated his life to strengthening the national government and economy.